Education is constantly in a state of flux. This is not new, even though it seems like we have been hit with an enormous amount of huge changes all at once. These “new” changes bring many concerns to those affected. When I think about my biggest concern about education today, though, it has nothing to with standards, teacher accountability or how well technology is integrated into instruction…or maybe it does. My biggest concern is about relationships. Life is about relationships, and we (educators) are sharing life with these kids every day, trying to show them and teach them how to live life now and in the future. 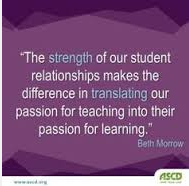 I’m concerned that teachers won’t have the time (or be too overwhelmed) to form real relationships with their students. I’m concerned that teachers and administrators won’t build trusting, authentic relationships with one another. I’m concerned that too many students don’t have caring adults in their lives. I’m concerned that character education, collaboration skills, and public speaking skills will get pushed to the side to drill and kill for standardized test “growth” data. So what can we do? Thankfully, I think many teachers are already conquering this concern. Most teachers care more about their students than any other aspect of their jobs. There are others, though, who are burned out, stressed out, or checked out. That’s not fair to the students they are teaching. Starting with the administrators, we need to model caring relationships. We have to talk to people, and more importantly, we have to listen. Find out why that student is always so tired in class instead of assuming they were up too late playing video games. Listen to that parent who is recently divorced, can barely make it through each day, let alone help their child with complicated math homework each evening. Administrators and teachers need to listen to each other to come to a shared vision and goals for what is best of the students in that school district. Employees will work harder for leaders they respect and care for. The same goes for students. So, while we have to meet standards, show growth, and integrate quality technology to engage our students, we need to keep them first. Care about people, and the other “stuff” will fall into place.